Atlantis Eyecare surgeons now offer the ultra-advanced TRULIGN® toric lens implants at our Huntington Beach, Long Beach, Newport Beach, Laguna Hills, Anaheim, Downey and San Pedro offices. Atlantis Eyecare surgeons Dwayne Logan MD and Ehsan Sadri MD, are one of the first surgeons to be offering this outstanding lens which was just approved by the FDA on May 21, 2013. What is TRULIGN® Toric IOL? The TRULIGN is one of the newest and most advanced types of intraocular lens implants. Intraocular lenses (or IOLs) are used to replace the natural lens of the eye following removal of a cataract. The TRULIGN® Toric lens is ideal for patients that have significant astigmatism and would like to see better up close. There is currently no other lens on the market that corrects up to three diopters (a unit of optical strength) of astigmatism and gives you the near vision that TRULIGN® can. If you want to be free from glasses and greatly improve your astigmatism, TRULIGN is the lens for you. One of the greatest advantages of the TRULIGN® Toric IOL is that it is designed to allow the eye to focus on objects at a range of distances not just at far away, as is the case with many monofocal lenses. 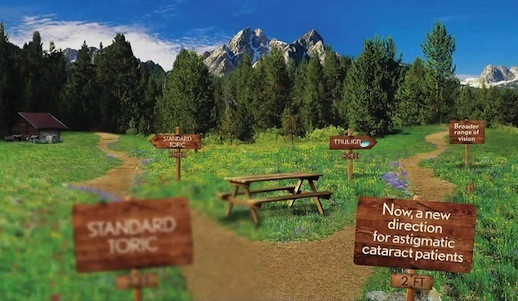 The standard monofocal IOL that is fully covered by most insurances can deliver improved vision, however this is only at one distance, usually far. As a result, patients who receive the standard monofocal lens implants after cataract surgery more often require glasses for near vision. This can even occur for patients who didn’t require glasses prior to cataract surgery. Multi-focal lenses are a great option which can enable you to see well at all distances: far, intermediate, and near. The one downfall of the multi-focal lenses is that they cannot correct astigmatism, which affects nearly one in every three individuals. The standard toric IOL is a lens that corrects for any astigmatism one may have. In addition, it will deliver improved distance at one distance, usually far. As a result, you will most likely require glasses for intermediate and near vision. This option is recommended for people with a good amount of astigmatism in which cannot be corrected through the standard monofocal lens. The difference between the standard toric lens and the Trulign toric lens is that the Trulign lens can correct your near and intermediate vision. Is TRULIGN Right For Me? The best way to determine if you are a good candidate for TRULIGN® is to have a cataract consultation with one of our surgeons. Our cataract surgeons (Dr. Dwayne K. Logan and Dr. Ehsan Sadri) are both among the most experienced cataract surgeons in the country and have contributed to numerous publications on cataract surgery and the many new lens options that exist today. Both have been recognized by Premier Surgeon as one of the top 250 leading innovators in the field of Premium IOL surgery.